DARCO Europe E-Journal Archive (2015 - 2018) - Overview of the Expertise and Featured Product chapters. Here you can download all DARCO Europe E-Journals from the years 2015 to 2018 as PDF files. If you wish to have an all-in-one overview of the Expertise and Featured Product chapters from those issues, you can request the DARCO E-Journal Compendium; now Part 1 & 2. 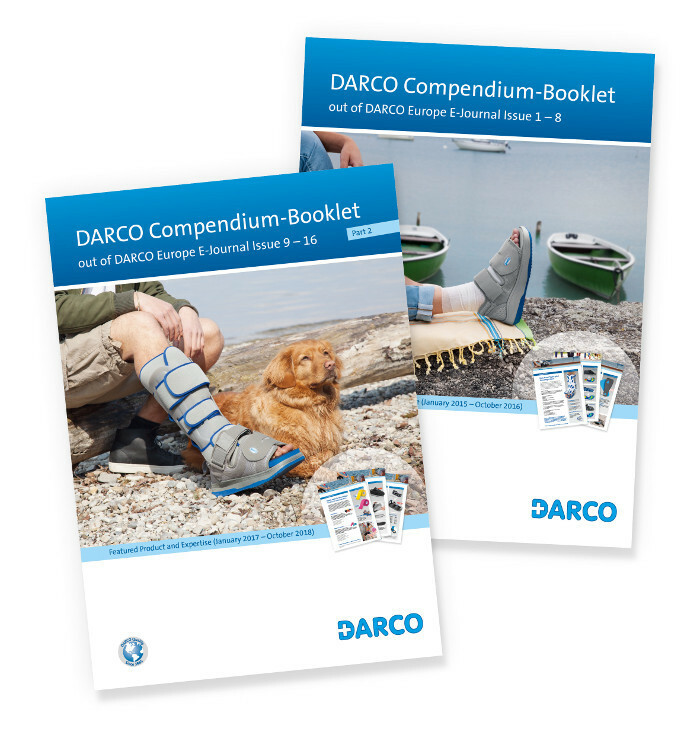 Please read on to see how to order both DARCO Compendium-Booklets. The DARCO Europe E-Journal Compendium-Booklets summarize the chapters "Featured product" and "Expertise" of issues 1 to 8 (Part 1) and 9 to 16 (Part 2) of the DARCO Europe E-Journal. Issue 1 (Jan 2015), feat. MedSurg Healing Shoe: "Member of Woundcare-Circle..."
Issue 2 (Apr 2015), feat. OrthoWedge Off-loading Shoe: "Spring time is..."
Issue 3 (July 2015), feat. 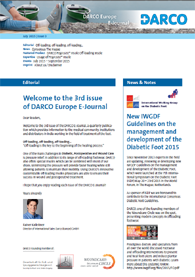 DARCO PegAssist® Insole: "New IWGDF Guidelines..."
Issue 4 (October 2015), feat. 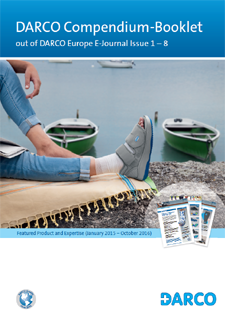 TAS® Toe Alignment Splint: "30 years of partnership..."
Issue 5 (January 2016), feat. 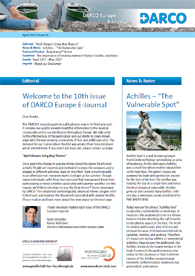 DARCO Ankle supports: "Benefits of the digital world..."
Issue 6 (Apr 2016), feat. WCS Woundcare Shoe System: "Woundcare-Circle ..."
Issue 7 (July 2016), feat. Body Armor® Night Splint: "Plantar Fasciitis? ..."
Issue 8 (October 2016), feat. 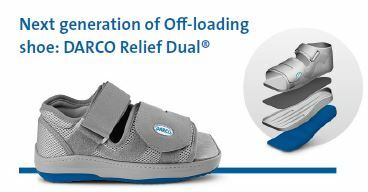 Relief Dual® Off -loading Shoe: "Always one step ahead..."
Issue 9 (January 2017): "E-Journal Compendium & Fresh Breeze 2017"
Issue 10 (April 2017), feat. Body Armor® Sleeve : "April showers bring May flowers"
Issue 11 (July 2017), feat. MECRON Tapes: "Hot news this Summer..."
Issue 12 (October 2017), feat. AllRound Shoe®: "Good bye Summer. Hello Autumn!" Issue 13 (January 2018), feat. HeelWedge®: "Think to the future - Learn from the past"
Issue 14 (April 2018), feat Body Armor® Cast Shoe: "Visit us at OTWorld, Leipzig!" Issue 15 (July 2018), feat. Pediatric Products: "Cheering up small patients..."
Issue 16 (October 2018), feat. Relief Insert Walker: "2019: New design and a breath..."
In the following section you will find previously released "E-Journal" issues. The archive is in chronological order with the most current issue featured first. 2019: New design and a breath of fresh air! After 4 years of sending out the DARCO Europe E-Journal we now decided to give a visual and technical facelift to the E-Journal. It remains our goal to provide insightful information to the medical community and to our distributors throughout Europe. From January 2019 on, it will be much easier for you to read all articles of DARCO Europe E-Journal with fewer mouse-clicks, making it more comfortable to receive all important information at a glance. But you won't have to wait for 2019 for something new from DARCO. In this final issue of 2018 we introduce to you a completely new innovation: Relief Insert® Walker. The Relief Insert® Walker was designed here in Bavaria. By combining the insightful input from a German Dr. and the ingenuity of DARCO developers, we've created a versatile and effective healing orthotic. The Relief Insert® Walker was one of the highlights presented at the international OTWorld this year and it received profound recognition by international orthopaedic technicians and the medical professionals alike. We're excited to share our latest innovation with you. 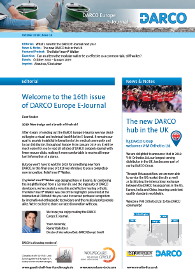 We hope you enjoy reading the DARCO Europe E-Journal. hg DARCO Group welcomes V-M Orthotics Ltd.
We are delighted to announce that in 2018 V-M Orthotics Ltd, our longest serving distributor in the UK, has become part of our hg DARCO Group. Through this acquisition, we are now able to service the UK market directly as well as facilitating the international exchange between the DARCO headquarters in the US, Europe, India and China; insuring consistent quality standards worldwide. Welcome V-M Orthotics Ltd. to the DARCO community! > More information: "NEW: DARCO strengthens its presence in the United Kingdom ..."
Our 15th issue of the DARCO Europe E-Journal is dedicated to the little people in our lives. Our pediatric products may not generate big sales, but are certain to create big smiles. This is why a simple, but effective orthopaedic shoe can make all the difference in the world to your young patient. 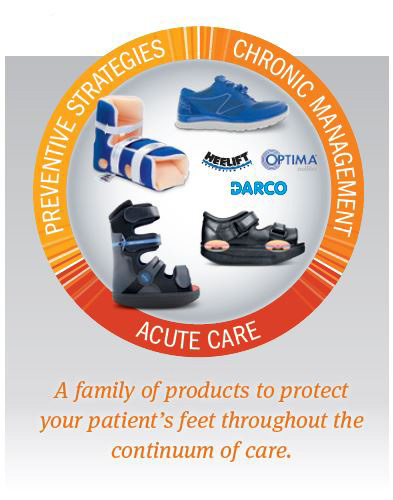 Whether it's post-surgical or a plaster cast, DARCO has the right shoe for your every patient. DARCO is a trusted partner for developing orthopaedic shoes for foot and ankle injuries and integrates more than 30 years of experience into every shoe we make. We know how biomechanical effects can influence the entire healing process and just how important this phase is to ensure long-term success. From the small active child to the fully grown - DARCO offers quality, reliable products that are adaptable to the needs of all patients. Please continue reading and you'll learn how we can help with that one particular patient, who may actually be the most demanding. 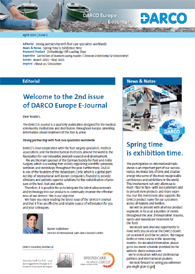 We hope you enjoy reading the latest issue of DARCO Europe E-Journal! Visit us at OTWorld Leipzig, Germany! It's now only a few weeks away (May 15 - 18) and it brightens our daily business here at DARCO Europe. We're proud to be a part of this world class event and this year even more so, because we'll be launching some truly interesting new products. The DARCO Relief Insert® Walker and the PegContour Insole. We value this opportunity to stage our latest innovations and to build new professional relationships. There is a distinctive symbiosis between the exhibitor and the audience at OTWorld. Professionals from the industry engage face to face with orthopaedic technicians, medical professionals and caregivers from a range of expertise in the field; gathering from all over the world with a common goal: to improve the health care quality and options for the patients we all service. But it's not only the "New" - We continue to make improvements to our core products as well. The Body Armor® Cast Shoe has been a popular and reliable DARCO product for many years and it's just one example where new innovations provide a clear benefit to the patient. Read on, this clever solution is featured in this issue along with another quality expertise article. We hope you enjoy the quick read and we look forward to seeing you at OTWorld in Leipzig, Germany. DARCO product demonstration videos are available online! DARCO's customers and sales team have a valuable resource to help answer questions about product features and learn more about the benefit and use of DARCO products. We are pleased to present several educational videos. The handling of the aids is conveyed in practical step-by-step instructions. The videos offer an easy and convenient way to get more information on how to adjust the DARCO device and how to control perfect fit and comfort in order to secure safe healing. Each video features a two-minute demonstration in English, French or Spanish language. Coming soon! New DARCO product videos: Relief Insert® Walker and PegContour Insole. It's a new year and we not only take look back but also set our sights on the positive direction 2018 will take us and where we want to go. Our objectives remain the same and so too will the E-Journal. We will continue to bring you the latest from our perspective and remain dedicated to the sharing of knowledge and information. We hope you enjoy reading the E-Journal and would welcome any feedback you'd like to contribute. 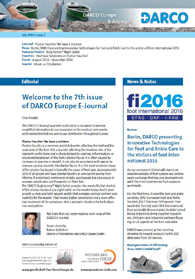 In this issue of DARCO's E-Journal, we adress the subject of innovation in foot care technology and what changes we've made to remain "one step ahead". And we return to a tried and tested device in our portfolio. The E-Journal allows us to keep you abridged on all the advancements we're pursuing. Many orthopaedic disorders relate to the rear foot. Common ailments like plantar fasciitis and posterior tibial tendon dysfunction to more severe problems such as Charcot arthropathy, rheumatoid arthritis, neuromuscular disease, and the devastating event of amputations, can all affect the rear foot or ankle. The management of orthopaedic therapy has extensively engaged in the treatment of all of these conditions and DARCO is a leading medical device provider in this specialized field of therapy. For DARCO, that means taking into consideration all points of view: Technicians, Designers, Doctors, Patients and the Distributor. DARCO takes the input from national and international trade shows as well as the insights from medical professionals and close partners when moving forward with innovations. Good bye Summer. Hello Autumn! We're dedicated to sharing information and knowledge with the foot and ankle community through our E-Journal publication. With this 12th issue, we're pleased to announce a new therapeutic shoe offering a broad based solution to protect at risk feet. What an inspiring time! "Autumn carries more gold in its pocket than all the other seasons" a quote from the late American journalist Jim Bishop. We concur and it reminds us that nothing stays the same! The new seasons not only represent change and movement but also clarity. This time of the year for DARCO means the calendar is packed with events all over Europe. In addition, this year it included our 8th Distributors Meeting where professionals from 10 countries within the EU joined us here in Bavaria. It was a valuable exchange and we were allowed to demonstrate firsthand how we are shifting the paradigm in therapeutic shoes. Featured here in the 12th issue is just one of our newest products; the AllRound Shoe. DARCO has capitalized on our new technology shifts as well as improved manufacturing processes and we feel this shoe provides greater all round protection for the feet. And please engage yourself to find out just how our colors are changing over here at DARCO Europe. We'd love to hear from you! The Distributor Meeting was a wonderful event here in Raisting this year. 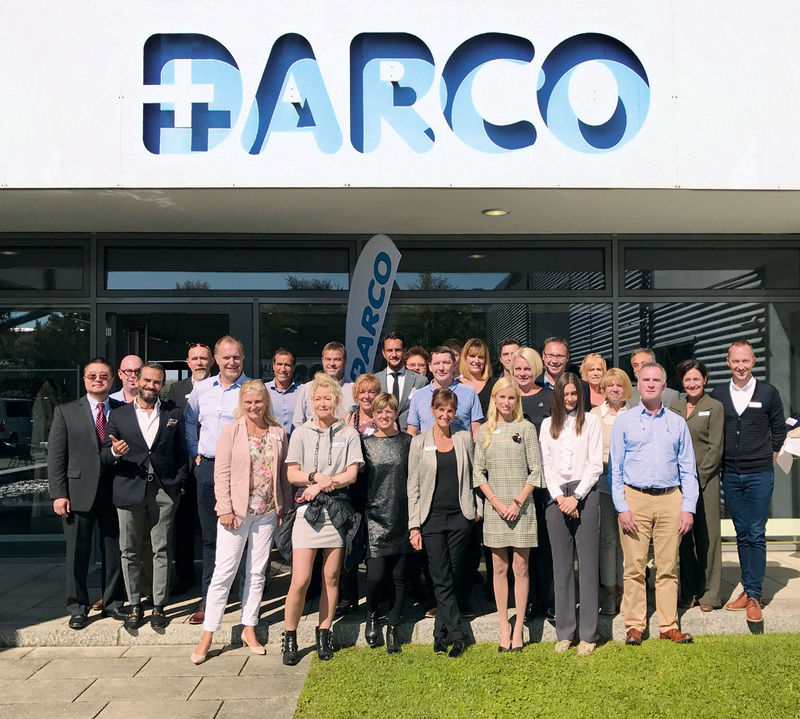 We all enjoyed the opportunity for relationship building and to strengthen the DARCO brand in the multiple markets that are represented by our European partners. Face to face we could share the latest; from our restructuring to the expansion of our manufacturing. DARCO is evolving every day and we were excited to share all the new happenings going on here in Raisting. But more importantly, the meeting enabled us to demonstrate how the market demands have influenced our R&D developments. DARCO strives to remain "one step ahead" and by working directly with Dr.s and engaging in "Open Innovation" we've developed better protective footwear and are launching other creative solutions for the feet. 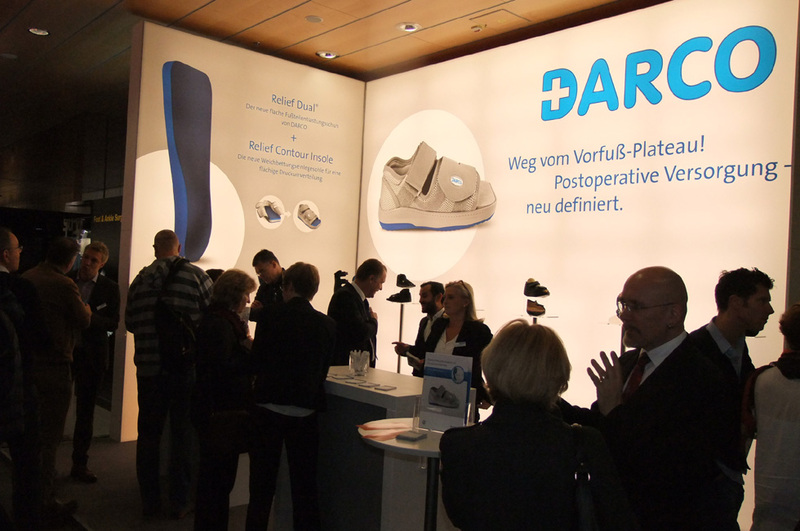 The AllRound Shoe, our Relief Dual Insert and our new TASO series of therapeutic socks were all staged at the meeting. Evidence shows a continual need for quality, inventive solutions to protect the feet and we intuitively remain as close as we can to the developing guide lines. 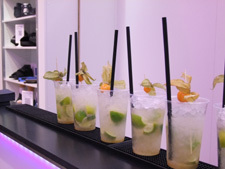 "How we welcomed our European distributors!" Viva España: DARCO-Europe.com is now online in Spanish! Access to the E-Journal can be reached through all of our multi-language sites. In fact, we're currently working on our French language site - 'vive la France'! Please come and check out what new things we've added to our website. The E-Journal is just one part of a greater mission we have here at DARCO. Our role in promoting the exchange of information and knowledge spans all the way back to the beginning with our founder Dr. Darby. We continue still to connect professionals in the field in order to elevate the industry standards. The foot and ankle community is ever growing and the E-Journal allows us to reach a larger audience, not only in the medical community, but also with our distributors in Europe and surprisingly, well beyond the EU. As the summer heats up, so too increases the physical demands of the active individual. Therefore in this E-Journal we would like to introduce our portfolio of MECRON Tapes. The tapes are a simple and effective way to provide that extra help and support for everyone under the sun. So, read on and keep cool. 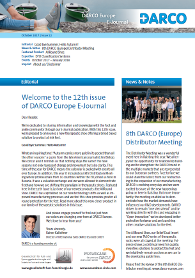 in DARCO Europe E-Journal 11th issue! 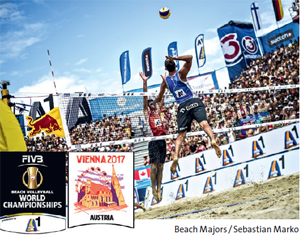 The summer is heating up here in Europe as all eyes await the competition and the crowning of the new champions. At the highest level of this professional sport you will see the Athletes taped with bright colors while displaying the many taping techniques leading the way in this form of therapy. Elastic Taping is taking the world by storm - and DARCO is leading the way. The DARCO E-Journal quarterly publication is now in its third year and it remains our goal to provide insightful information to the medical community and to our distributors throughout Europe. We take pride in the effectiveness of the publication and our ability to share knowledge with the ever growing community of foot and ankle specialists. The demand for our Compendium Booklet was greater than forecasted and we've printed more. If you didn't get yours yet, please contact us today. Once again the change in seasons brings about the desire for physical activity. People are inspired and motivated to enjoy the outdoors and to engage in different activities. Back on their feet, from a morning walk to an afternoon run; everyone wants to shape up for summer. Though many individuals suffer from heel pain and that may prevent them from participating in those activities associated with warmer weather. For this reason, we'd like to introduce to you the Body Armor® Sleeve developed by DARCO. This simple but technologically advanced Sleeve can give relief to heel pain and improve the discomfort associated with plantar fasciitis. in DARCO Europe E-Journal 10th issue! We hope you enjoy reading each issue of the DARCO E-Journal. Achilles - "The Vulnerable Spot"
Achilles heel is a well-known synonym from Greek mythology symbolizing an area of weakness. As the story goes, Achilles was a small boy whose mother dipped him in the river Styx. The water's magic empowered his body with protection; except for the heel of his foot. The mother was holding the boy by a single foot and hence this heel remained vulnerable. Achilles grew up and survived many battles. Until one day, a poisonous arrow penetrated his heel and he died. 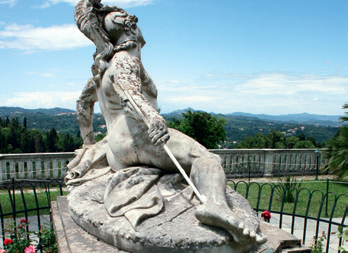 Today, we use the phrase "Achilles heel" to describe a vulnerability or weakness. In medicine, this anatomical term is a fibrous band or tendon attaching the calf muscles to the plantar aspect of the foot. The Achilles tendon withstands a lot of stress and pressure because of its instrumental role in jumping, running, and walking. Therefore, it's important during athletic or recreational activities. Passing over the ankle joint, the Achilles tendon is the largest tendon in the body. It connects the gastrocnemius and soleus to the calcaneus or heel. Common injuries of the Achilles tendon include tendonitis (inflammation), tendinosis (degeneration), and rupture. The DARCO E-Journal quarterly publication is designed to provide insightful information to our associates in the medical community, professional institutions and to our distributors throughout Europe. DARCO wants to start the New Year with dynamic and energy. This is why we would like to extend our credo in "innovation" not only in foot care technology, but also in communication with our partners, to fulfil your needs and proposals in regards to our DARCO Europe E-Journal. It makes us thankful and confident, that we can interact with our valued readers to make the E-Journal even better. This is why Issue Number 9 is something special: You will find a preview of our E-Journal Compendium, a summery of comprehensive expertise and product overview, which can be ordered easily by mailer. For those readers who would like to share their experiences and give us their recommendation on a short survey, a special DARCO gift is waiting for them. Just share your thoughts with us and give us some input - the DARCO gift will be sent out to you at once. 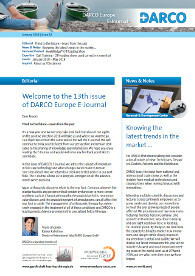 The DARCO Europe E-Journal Compendium summarizes the chapters "Featured product" and "Expertise" of issues 1 to 8 of the DARCO Europe E-Journal. It is intended to enable our readers and visitors of the DARCO website to get a deeper knowledge of our products than he would get by only looking at our catalogue or website. Within this summery you will get a well combined information putting together product details and expertise in one paper. It also aims to raise awareness of the information provided by us on a quarterly base, so that you can share the information with your partners and colleagues. The booklet will come in a high quality printed version. Easy to share with colleagues and partners. Please send an E-Mail to info@darco-europe.com. We will be happy to send you the Compendium-Booklet free of charge. Receive a nice DARCO sportsbag! In this issue of the DARCO E-Journal we would like to take the opportunity to get some feedback from our readers to serve you even better. Please help us by taking a few minutes to tell us about our E-Journal and service that you have received so far. We appreciate your business and want to make sure we meet your expectations. The DARCO E-Journal quarterly publication is designed to provide in-sightful information to our associates in the medical community, professional institutions and to our distributors throughout Europe. In 2015 DARCO's Relief Dual®, created a shift in paradigm in the scientific community. The Relief Dual® revolutionizes "off -loading" technology. Our philosophy: "off -loading as much as needed - weight bearing as much as possible". Learn more about this promising postoperative shoe in this issue and on our web site. I hope you enjoy reading each issue of the DARCO E-Journal. As main sponsor of the independent German Association for Foot Surgery (GFFC), DARCO congratulates the GFFC with their 20 year anniversary. DARCO and GFFC look back on many years of success and cooperation. DARCO has always been dedicated to support scientific symposia, seminars and workshops. From day one of our cooperation with GFFC, we were able to meet and work directly with the medical community; receiving invaluable, open and honest feedback on our ideas and finally our products. DARCO's close cooperation with foot surgery specialists, medical associations and biomechanical institutions from around the world is our basis for innovative product research and development. These long-term relationships have allowed us to develop ground-breaking advancements in the industry as well as maintaining the highest quality standards for our products. "From the practice - for the practice" this is how the GFFC formulates its motto. The Association was founded to educate its members on a regular basis on the latest developments in conservative and surgical therapies for the treatment of foot. We echo this philosophy and fully support the GFFC. With pride, we congratulate the Association for the past 20 years of tremendous success updating and educating the now 1.700 members with ultimately the highest standards on new procedures and proven therapies in foot surgery. We will remain a loyal and dedicated partner. Once again DARCO will STOP and focus our eff orts towards this very special and important event. The worldwide "Stop Pressure Ulcer Day" was created by the Spanish National Group for the Study and Advice on Pressure Ulcers together with the Ibero-Latin-American Society on Wounds. These two organizations formed the Declaration of Rio with the objective to "speak out" against people developing pressure ulcers and to elevate awareness about prevention. DARCO'sinvolvement with the event is in line with our goal to develop partnerships and multifaceted programs to reduce foot ulcerations and amputations worldwide. Our campaign this year is designed to support proactive prevention. Daily inspection, appropriate foot-wear and good foot care are all important parts in preventing pressure ulcers on the foot. We are committed to elevate the public awareness to the realities of pressure ulcers and to proactively empower individuals and the medical community. This year for the event, we're off ering an inspection mirror plus valuable information designed to help patients keep an eye on their feet. Download Flyer: "Pressure Ulcers - Prevention and Treatment. November 2016 - Events worth noting! Foot problems frequently develop as a result of having diabetes - but this can be avoided. Understanding the risk factors, proper foot maintenance and the need for regular foot examinations are essential for preventing foot ulcers in patients with diabetes. One of the most critical factors in prevention is education. Education can empower those suff ering from diabetes to take control of their condition and reduce the risk of ulcerations. With knowledge, skills and confidence, individuals can integrate effective self-management strategies into their daily routine and hence, improving their quality of lives. DARCO realizes the importance of elevating awareness. You too can get informed and involved. There are two major campaigns in November. Check them out! Plantar Fasciitis? We have a solution! Plantar fasciitis is a common, painful disorder affecting the heel and the underside of the foot. It is a disorder affecting the insertion site of the ligament on the bone and is characterized by scarring, inflammation, or structural breakdown of the foot's plantar fascia. It is often caused by increases in exercise or weight. It can also be associated with age or by overuse causing injury to the plantar fascia. It is the most common injury of the plantar fascia and is typically the cause of heel pain. Approximately 10 % of all people will have plantar fasciitis at some point during their lifetime. It is relatively common in middle aged people but also occurs in younger people who are frequently on their feet. The DARCO Body Armor® Night Splint provides the most effective stretch of the plantar fascia of any night splint on the market today. And it does so with a sleek and light-weight profile that provides optimal comfort and livability for the wearer. That means higher compliance and a more effective treatment of the symptoms. It is a win/win situation for both physician and patient. 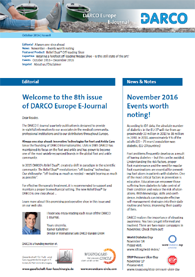 We hope that you enjoy reading each issue of the DARCO E-Journal! As our company is historically based on deep knowledge of foot surgery we continuously exchange findings and developments with the most experienced foot surgeons worldwide. For the first time, 3 scientific foot and ankle societies, EFAS (European Foot and Ankle Society), D.A.F (German Orthopaedic Foot and Ankle Society) and i-FAB (International Foot and Ankle Biomechanics Society) joined forces in Berlin to bring together researchers, clinicians and industrial partners focusing on all aspects of the foot and ankle. DARCO was present at this meeting showing its newest products to the 600 attendees from 50 nations. OPTIMA, DM Systems and DARCO. Live product demonstrations and presentations of the new Diabetic Foot Off-loading Algorithm® premiered to an international audience of health care practitioners. DARCO E-Journal is now one year old and we're proud to say it has been an amazing success. Our subscribership has swelled to over 1000. We're serious about providing effective and valuable information to our associates in the medical community, as well as to professional institutions and to our distributors throughout Europe. Get pressure ulcers under control! The Woundcare-Circle is a global alliance of product development specialists working to bring clinicians superior solutions for off-loading lower extremity ulcers with the primary goal to achieve improved clinical outcomes. Diabetes is a disease that affects millions of people worldwide. DARCO is dedicated to developing products that are specifically designed to promote and accelerate the healing process in the event of foot ulcerations. We here at DARCO, are acutely focused on creating innovative solutions for wound prevention and therapeutic treatments. 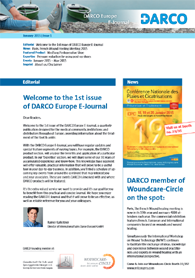 DARCO is proud to be one of the original founders of the Woundcare-Circle. This global partnership was founded 2014 and has proactively made contributions to clinicians and patients through product development and the dissemination of a clinically approved therapy programme. 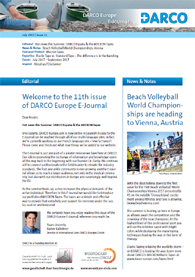 We hope you enjoy reading each issue of the DARCO E-Journal! EWMA 2016: Patients. Wounds. Rights. 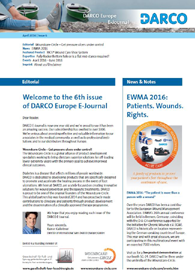 EWMA 2016: "The patient is more than a person with a wound"
Over the years DARCO has been a contributor to the European Wound Management Association. EWMA's 26th annual conference will be held in Bremen, Germany; coinciding with the D-A-CH conference supported by the Initiative for Chronic Wounds e.V. (ICW). DARCO is historically on location representing the German speaking countries of Europe. This year and with great pleasure, we are participating in this multinational event with an expected 7000 visitors. Visit us for a live product demonstration at our booth 5G-24. DARCO will be there under the umbrella of the Woundcare-Circle. 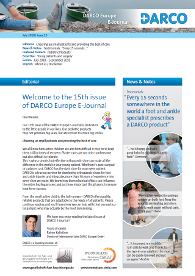 The DARCO Europe E-Journal quarterly publication is designed to provide insightful information to our associates in the medical community, professional institutions and to our distributors throughout Europe. It's no secret that today's generation rely completely on the World Wide Web for their product information. That's why we here at DARCO transform our digital presence continuously. From anywhere in the world, we're just a few clicks away for patients, as well as for our distributors. For the marketers, creating more consumer friendly websites is an ever growing challenge. The digital access to product information is very important. DARCO will offer patients and customers easy access to valuable information as well as providing educational information on the Web. We are providing product videos which can be seen on our website and the E-Journal which is available for download. Our dedicated category, E-Journal provides all previously published articles on expertise and more. Detailed product information is available for our distributor base via our distributor download centre. Explore what we have to offer! The Annual Meeting of the German Society for Foot and Ankle Surgery (GFFC) in Munich signifies the most important event of the year for the nearly 1700 members. 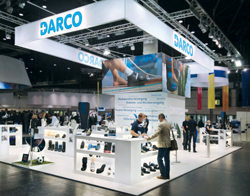 DARCO is front and centre exhibiting innovations achieved throughout the year. Since its inception, DARCO has been one of the main sponsors of this yearly event. The GFFC was founded shortly after the opening of DARCO Europe in 1996. From the beginning, DARCO Europe has supported the society in its effort to promote the exchange of knowledge and expertise among the most experienced foot surgeons from all over the world. Upholding the motto; "putting real life examples into practice" GFFC continuously strives to nurture the highest quality of standards in the realm of foot surgery. Keeping with tradition, DARCO hosted a workshop luncheon focusing on the advancements we've achieved in new product development. In 2015 DARCO's Relief Dual®, created a shift in paradigm in the scientific community. The Relief Dual® revolutionizes the "off-loading" technology. Our philosophy: "off-loading as much as needed - weight bearing as much as possible". Arab Health serves as a meeting point, especially for our Arabic and Indian customers. Historically, the number of visitors from India and other neighbouring countries has been remarkable. This diversity has encouraged us to expand our booth this year as a central hub for DARCO International and DARCO India, represented by both CEOs; Darrel Darby and Professor Shashi Surpali respectively. "The Middle East market is one of the fastest growing markets in orthopaedic footwear and therefore a very important region for us," says Darrel Darby, President DARCO International. A common goal of all Middle Eastern countries is to significantly improve the medical health care of its populations; this is where DARCO wants to contribute. 3 professional partners - caring for foot ulcerations with a clinically approved therapy programme! The Woundcare-Circle is a global partnership, founded to provide clinicians and patients superior solutions for the redistribution of pressure at the heel, foot and ankle by enabling the development and dissemination of clinical evidence focusing on best practice based on a clinically approved therapy programme. Our tag line, "Innovation in Foot Care Technology" originates from our work with the top innovators and leading scientists in the treatment of the foot and ankle. Through our experience and close association with the medical community we have nurtured the advancement of knowledge and expertise all over the world. We host and sponsor medical workshops in an effort to provide physicians and medical experts with the latest innovations and developments in the industry. This year DARCO International is proud to be celebrating its 30 year anniversary. 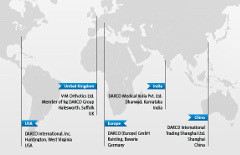 Today, DARCO is throughout the world with locations in the USA, Europe, China and India. All with one common goal, to improve the timely healing of foot injuries with high quality products. reading each issue of the DARCO E-Journal! DARCO's involvement with the event is in line with our goal to develop partnerships and programs to help reduce the incidence of foot ulcerations worldwide. This year we want to motivate individuals to be proactive and to elevate awareness. Daily foot inspection and appropriate foot-wear can prevent pressure ulcers. Our "kit" is based on these simple principles. We have coupled an inspection mirror with valuable information intended to help patients keep an eye on their feet. "Off-loading is the key to the beginning of the healing process." One of the main challenges in Diabetic, Postoperative and Wound Care is pressure relief. 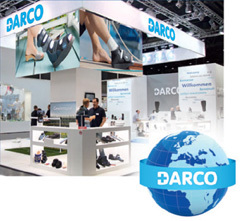 In addition to our range of off-loading footwear, DARCO offers specialized insoles which can be combined with most DARCO footwear. The combination helps to minimize the pressure and promotes faster healing. In the end, the patients can maintain their mobility while improving the quality of life. Physicians are able to ensure their success in wound and postoperative treatment by using DARCO's innovative customizable off-loading insoles. Using DARCO's innovative customizable off-loading insoles physicians are able to ensure their success in wound and postoperative treatment. This year the IWGDF announced their latest findings at the 7th International Symposium on the Diabetic Foot at the World Forum in The Hague-Netherlands. Since November 2013 experts in the field are developing, updating and renewing the IWGDF Guidelines on the Management and the Prevention of the Diabetic Foot. Through our sponsorship of the IWGDF, DARCO is honored to be a contributor to the International Consensus of the Diabetic Foot Guidelines. DARCO, a founding member of the Woundcare Circle was on location at the International Symposium presenting modern concepts in offloading footwear. 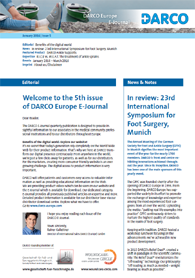 The DARCO E-Journal is a quarterly publication designed for the medical community, institutions and distributors throughout Europe, providing information about treatment of the foot and ankle. DARCO'sclose cooperation with the foot surgery specialists, medical associations and the biomechanical institutes around the world is the foundation for our innovative product research and development. We are the main sponsor of the German Society for Foot and Ankle Surgery, which is a leading foot society organizing scientific symposia, seminars and workshops throughout the year. Furthermore, DARCO is one of the founders of the Woundcare-Circle which is a global partnership of international well-known companies; founded to provide clinicians and patients superior solutions for the redistribution of pressure at the heel, foot and ankle. Therefore, it is possible for us to integrate the latest advancements and technology into our products to continually improve the effectiveness of our devices - this is our objective. We hope you enjoy reading the latest issue of the DARCO Europe E-Journal and that it'll be an effective and reliable source of information for you and your colleagues. The participation on international trade shows is an important part of our success. Hence, we invest lots of time and creative energy into some of the most recognizable conferences and exhibitions in the world. This involvement not only allows us to meet "face to face" with our customers and to present new products and share expertise, but this investment also supports the DARCO product name for our customers across all regions and borders. We would welcome any opportunity to meet with you on site at the DARCO booth. Let us know if you'll be in London, The Hague, Berlin or even Austria in the upcoming months. For detailed information, please see our event schedule left. We're on location with our professional partners and international speakers. We look forward to seeing you wherever you might plan to go! 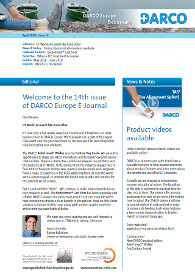 Thank you for your interest in the DARCO Europe E-Journal! 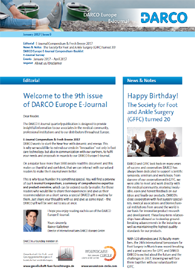 Welcome to the DARCO Europe E-Journal, a quarterly publication designed for the medical community, institutions and distributors throughout Europe; providing information about the treatment of the foot and ankle. Have a look at the 1st issue now and sign up to receive the forthcoming E-Journals. You can receive it uninterrupted on a quarterly basis. The DARCO E-Journal is your information source that is simple, effective and up-to-date. With this E-Journal have regular updates and special feature segments of varying topics. For example, the Featured Product section, will analyze the benefits and application of a particular product. In our Expertise section, we will share some of our 30 years of accumulated experience and know-how. This knowledge base segment will offer valuable, practical information that will prove to be a useful tool in your day-to-day business. In addition, you'll find a schedule of upcoming key events from around the continent that may interest you and your associates. These are events DARCO is involved with and where DARCO products will be featured. It's the extra valued service we want to provide and it's our goal for you to benefit from this practical and concise Journal. We hope you enjoy reading the DARCO Europe E-Journal and that it will prove to be an effective, as well as a reliable reference for you and your colleagues. 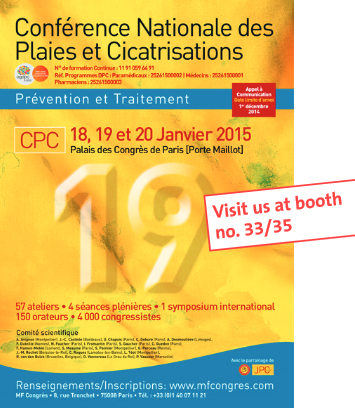 Paris, Jan 18-20, 2015: DARCO member of Woundcare-Circle on the spot! Paris, The French Wound healing meeting is now in its 19th year and averages 4000 attendees each year. The commercial exhibition features French, European and International companies focused on wounds and wound healing. Simultaneously the International Workshop on Wound Technology (IWWT) continues to facilitate the exchange of ideas, knowledge and experience between wound practitioners and experts in wound healing with an international perspective. Come & Join our Woundcare-Circle Booth 33/35! DARCO Europe E-Journal - Coming soon! 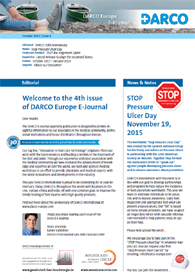 Starting January 15, 2015 we will launch the 1st DARCO Europe E-Journal. A quarterly publication which provides information to the medical community, institutions and distributors in Europe who practice in the treatment of the foot. Quarterly you will receive a downloadable PDF via email that you can collect or distribute to other interested colleagues or friends. The DARCO E-Journal is a medium to share information. Each edition will discuss the latest news on publications, meetings and procedures that focus on foot care. We will always provide you with latest information by regularly featuring a special DARCO product. Professional information on a high level will be performed by the chapter "Expertise", giving you the opportunity to know more about procedures and appropriate application of our products. Last but not least you will find the schedule of events highlighting those where DARCO products will be available. If you are interested, please don't hesitate and fill out the subscription form! 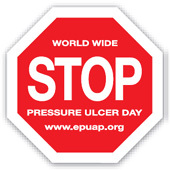 DARCO (Europe) has joined EPUAP (The European Pressure Ulcer Advisory Panel) in the worldwide initiative "STOP Pressure Ulcer Day". The Campaign's goal is to elevate awareness and promote education about pressure ulcers among medical professionals, communities and policy makers around the world. 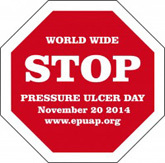 Press release DARCO (Europe) GmbH: "STOP Pressure Ulcer Day"
Woundcare-Circle: Get pressure ulcers under control.